To make home-made bread very soft, we may add more water, cream, butter and/or egg as "softener". But they (except the water) taste a bit sweet and rich, to make coffee roll they are absolutely fine. Since I wanted hamburger bun, I got to think other more suitable "softener". What about (white) cheese slice?! Could the taste be alright?!? The result turns out wonderful :) The bread is real soft, you might even confuse that it's from store. 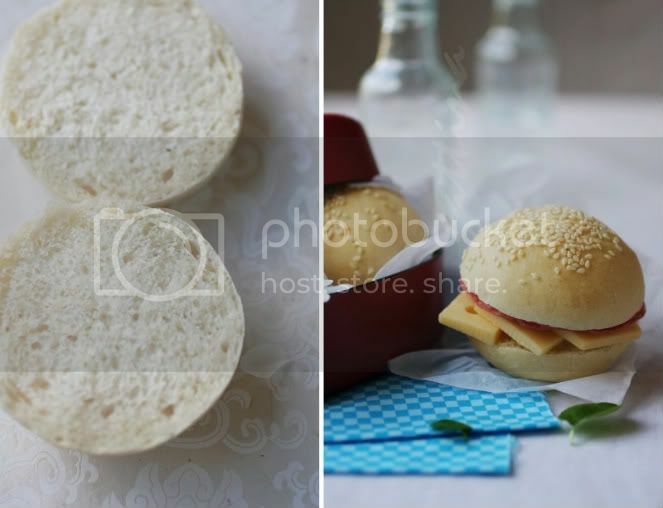 This type of cheese has no flavor, ironically hamburger bun doesn't need any cheese flavor, so it fits. There is one drawback though, the cheese contains conservatives, but not sure it would be a consolation to you if I tell you that 4 cheese slices can make over 30 mini buns, so each bread isn't that unhealthy, I think?! Last week was the Easter's holidays, I took some kids out a lot. To save little money we packed our snacks, one of them was this 2-bite-size bun (we sandwiched with ham or cheese or just salad). To see these mini buns, their cutie lunch boxes, their little hands... I was a big woman wearing a big wide smile. Well-combine all the ingredients. Knead dough until it's smooth and elastic. The dough must be a bit moist, although not sticky to hand. Place the dough in a pre-greased large bowl, cover, let it rest in fridge for a few hours. It should double its volume. Lightly dust the work table with little flour (or none at all if your dough doesn't stick), knead the dough about 30 times. Divide it into small portions (each weights 40 g). Cover them with a moist towel and rest until they return to room temperature. Shape the doughs into small balls, then sprinkle the toppings, place them on large baking trays. Cover them with moist towel, let them rest until they increase the volume to almost double. Pre-heat the oven to 190C. Throw in three ice cubes at the bottom of the oven, and immediately place the baking tray (bake one tray at a time) to the middle rack. Baking time should be less than 10 minutes. Tape the bottom of the bread if it sounds hollow, the bread is done. Repeat the same process to the next trays. The bread is still soft on the next day (keep them in refridge). But I'd suggest, after they cool off, just freeze all of the left-over. 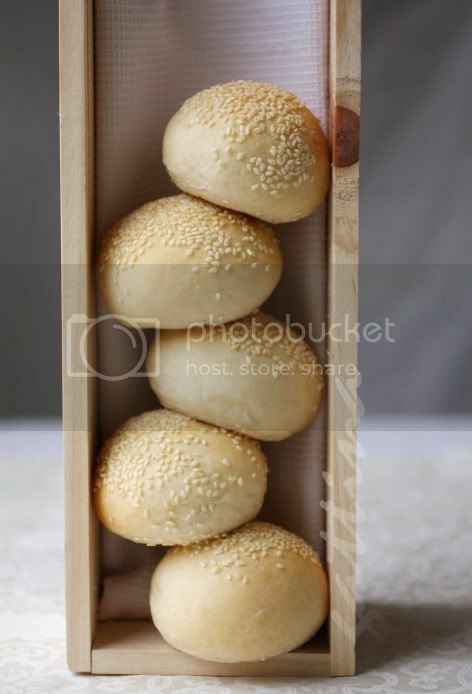 My husband has been asking me to bake good soft buns without eggs since sometime now....I am eagerly waiting for the directions !! The buns looks really soft and have a beautiful golden colour ! love the first photo! such a cute way to style a tray of bread. your photos always look so classy! is the purpose of throwing in the ice cubes for cooling down the temperature?